Norman cooking is one of the Grand Cuisines of France. The combination of an extensive 600km of coastline, rich fertile soils and temperate climate have always ensured a plentiful supply of seafood, an abundance of grass pastures to feed millions of dairy cattle, grow plenty of productive cereal crops for fattening pigs, beef cattle and poultry, and produce a range of superb fruit and vegetables which thrive in the long hours of daylight and warm summer temperatures. With the high quality and variety of all these ingredients, it’s not surprising that even the simplest classic dishes are standout affairs. Try oysters from La Vaste au Hougue, prawns from Honfleur, mussels from Barfleur , Coquilles St Jaques (scallops) from Grandcamp Maisy, Demoiselles (little lobsters) from Cherbourg, mackerel from Dieppe, and bulots (whelks) from Granville, not to mention the classic sole, turbot , sea bass and sea bream from all around the coast. Meat eaters should look out for pré-salé lamb from the salty pastures of Mont St Michel, fine pork and ham fermier, a wide variety of poultry including duck from Rouen, turkey from Sées, also pintade (guinea fowl), chapons (enormous chickens served at Christmas) pigeons and goose. The dairy foods are legendary. Starting with cream – that no self-respecting Nomandy kitchen can be without – it can be bought raw from the supermarket or transformed into the thick crème fraiche which is sold sometimes by the ladleful at markets. Moving on to butter, there is a bewildering choice. 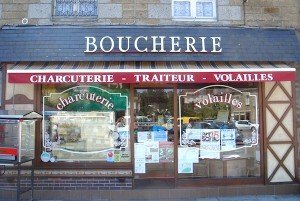 The top of the range is doubtless Le buerre Bordier which, while based just over the border with Brittany in St Malo, uses milk from both Normandy and Brittany herds. Moving down a notch, the local supermarkets devote whole aisles to different sorts: special Appellation Origine Contrôlé (AOC) from Isigny, salted, lightly salted or doux, made from raw milk or pasteurised. You can even buy hand churned buerre fermier made from the raw milk from a single herd of either Normande or Jersey cows. Then there is cheese. While there are about 30 types of Normandy cheeses, none is more famous than camembert from Camembert (41 km, 25 miles, 50 minutes). 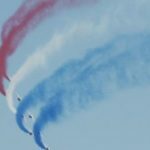 Along with baguettes and berets it is practically a symbol of France. 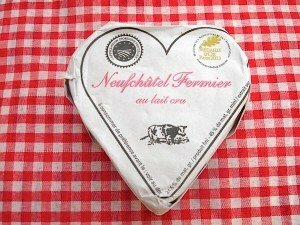 Our personal favourite, however, is the outstanding Coeur de Coutance from La Manche, while the delicious heart shaped Neufchatel, the oldest style of Normandy cheese, always looks fantastic on a cheese board. Vegetables are special, including the celebrated Carottes de Créances, recognisable by a coating of fine sand rather than being washed and bagged. Also cauliflower and leek from la Manche, cultivated watercress from Haute Normandie and wild samphire from the coast. Fruits are transformed into amazing products. Apples from the four million apple trees in Normandy become Tarte Normande or tarte tatin or beignets normande aux pommes (apple doughnuts). Or they are caramelised to accompany savoury sautés or reduced to sharp sauce for roast dishes. They can be turned into fine juices and of course the ubiquitous cider and calvados (apple eau de vie/brandy). To capture the essence of Normandy try simply deglazing a sauté pan with Calvados – the sweet heady perfume of apple will fill the kitchen. Pears become ‘Normandy champagne’ i.e. Poiré , or refreshing sorbets, sweet jelly and recently even the rare poiraigre, a pear flavoured vinegar which gives a fruity je ne sais quoi to salads and savoury dishes like sautés and roast pork.. Children will enjoy the Tergoule (Normandy rice pudding) and very popular pancakes or crêpes which are served with fruit or perhaps cherry conserve from Rouen and cream or ice cream. Their parents will enjoy the addition of Benedictine (a Normandy liqueur) or calvados! And then there is chocolate. 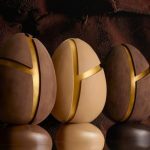 Fine chocolatiers compete to produce the most amazing window displays of local specialties. Le Ducs de Normande in Falaise make La Conquete de Guillaume, which they describe as ‘a square of nougat, perfumed with maniguette (a sort of pepper used a lot in the Middle Ages) covered with milk chocolate and stamped with a gold seal representing the equestrian statue of William the Conqueror which dominates the square outside the Town Hall in Falaise’. 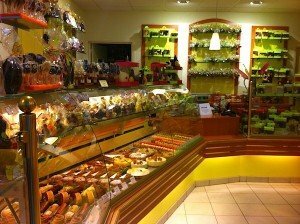 You can buy all your grocery supplies locally at the supermarkets in either Falaise (there are two, one at either end of the town) or Argentan (four) – good for wines and standard cheeses from all over France. Be warned however that the big supermarkets rarely open on Sundays. Or for better fruit and vegetables and interesting local delicacies, you can go to markets which happen on different days of the week depending on your location. In fact you can find a market every day of the week (i.e. 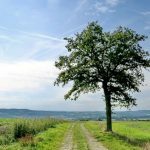 de quoi faire vos courses en plein air, tous les jours de la semaine!) For example, our nearest market is at Putanges on Thursday morning. Falaise market day is Saturday all day, whereas Argentan has markets on Tuesday, Thursday and Sunday mornings. 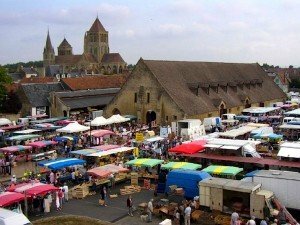 A fantastic Monday market takes place in the medieval town square of St Pierre-sur-Dives (34 km 21 miles 32 minutes) – it’s the biggest in Calvados. 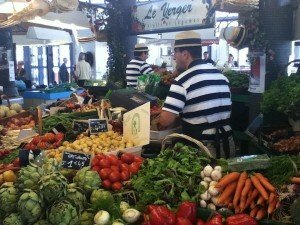 On Wednesday mornings serious gourmands take the trip up to Honfleur (105km, 65 miles, 1hr 12) to the celebrated morning Marché Bio – an organic produce market in Place Ste Catherine – which is also open later – up to 5pm – in July and August. To get the most from the markets, try to find the local producers. For example those who sell vegetables that were still in their gardens the day before. You have to walk past the others who have bought lesser quality produce from the MIN wholesale markets in Rouen and Rungis and are passing them on at a good mark-up. Another hint is to get there early and stand in the queues for the most popular stalls. The locals know what is worth waiting for. Perhaps give your children some euros and let them do some shopping for bread or their favourite pastries or whatever takes their fancy, to try out their French and perhaps begin a lifelong appreciation of la cuisine française. Vimoutiers (43 km, 46 miles,46 minutes) has a Monday afternoon market which is ideal for those who like to stay in bed for longer on their holidays! 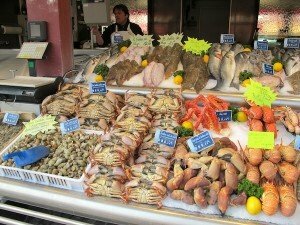 And while the daily fish markets on the coast are a fantastic sight (buy straight from the fishing boats at Honfleur) – you can also order a mixed platter of seafood at the local supermarket: Carrefours at Falaise do – Plateaux and Assiettes de Mer. You have a choice from 3 euros per person (Assiette Apéro) to 19 euros per person (Plateau Ocean Langouste). Simply fill out the simple order form giving the number of people to cater for and hand it in 48 hours in advance. Leclerc can provide a similar selection – order online Collect some baguettes and a few bottles of chilled Sancerre, Touraine sauvignon or crisp local cider, complete the trolley load with cheeses and some family size cartons of apple sorbet (which some of you will be dousing with aged calvados) to finish the meal and Voila! 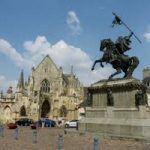 – you have the perfect take-away, à la Normande! Another option is to buy at the farm gate, for example, at La Mare farm in Les Rotours (9km, 5milex, 15 minutes) where seasonal organic vegetables , honey and home bred beef is available on Saturday mornings from 9h – 13hr. A more recent innovation is the organic Des Clics supermarket at Ifs (45km, 27 miles, 35 minutes). It stocks organic produce from producers all over Normandy and you can order online, for example, a basket of mixed vegetables in season for two, four or six people and then collect it from Monday to Saturday. They will do home deliveries but at 50 euros on top, so it makes sense to collect it yourself! It’s easy to find and handily situated on the way to/from the ferry port at Caen. Normandy has few but exquisite wines on offer. 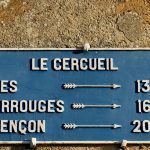 Only one small vineyard is renowned (locally) and produces excellent wines that will wonderfully accompany Normandy’s most famous meals. This is Arpents du Soleil at St Pierre sur Dives (31km, 19 miles 29 minutes.) and welcomes visitors for guided tours tasting and sales. For picnics and every day, consider also doing as the French do and keep a decent bag-in-box rosé on tap in the fridge. 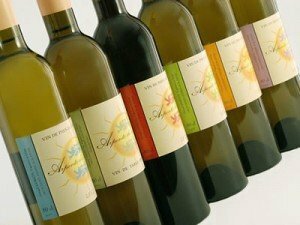 The quality and value of these environmentally friendly packaged wines can be surprising. There are also rather elegant looking ‘Winy Bar’ containers for these bag-in-box wines if you want to serve them at the table. 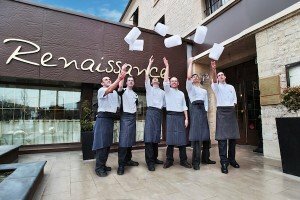 For birthdays or special occasions, rather than cooking, you could think about getting a local caterer (traiteur) in – we can liaise with them for you. 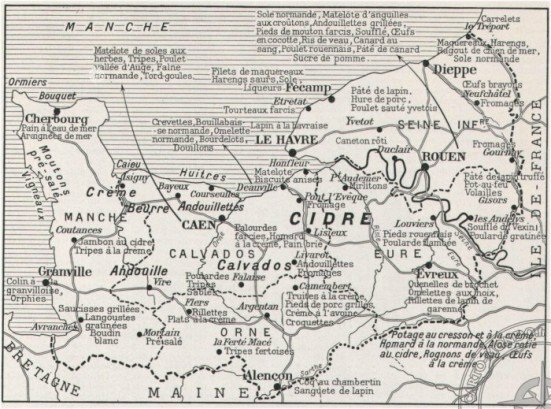 A good way to browse for those further afield, either in the countryside or the bigger towns, is to visit Michelin’s website and search by the map location or type in Falaise and take it from there. 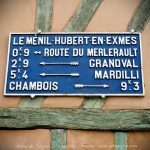 At the stellar end, there are about a dozen Michelin starred establishments in the whole of Normandy. Our nearest Michelin One Star is Auberge de la Mine at La Ferriere aux Etangs 61450 (37 km, 22 miles, 41 minutes). 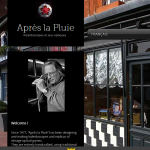 Our nearest Michelin Two Star is one of the most fashionable restaurants in France: the SaQuaNa in Honfleur (105 km, 65miles, 1hr 12) where apparently diners have been known to weep (with happiness!) during the 9 course degustation fusion menu. For the chateau experience there is the Michelin One Star Chateau de Sully 14400 (87 km, 54 miles, 1hr) – open for Sunday lunch. 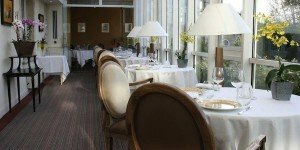 While a lunchtime meal at these provincial, superb quality restaurants represents the best way to experience the most refined French cooking at a fraction of Paris prices, it’s worth researching the menus (you can download many in advance) and ensure that they are what you are looking for. French fans call it an investment in le bon moment which gives you une belle emotion gustative and it certainly can be a memorable dining experience. I <3 Paris in the Springtime! 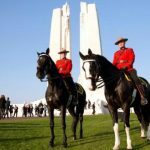 Happy Easter/ Joyeuses Pâques ! Un magnifique soleil couchant au Haras du Gazon.